There's a stigma of sorts attached to being a commercial filmmaker. If you succeed in crafting a well-paced, well-acted film that strives for nothing more than entertainment then you're a professional, a journeyman, nothing special. But what happens when you aim for commercial success and, despite hitting all the right notes, the product doesn't quite connect? Commercial filmmaking--"hit" filmmaking, to be more precise--is more complicated than simply casting pleasant-looking actors and executing a script that presents three acts with challenge and resolution. There's an energy, a rhythm, a spark that clicks with an audience and you can't fake that. For Shinobu Yaguchi, director of two of the more formulaic but irresistibly enjoyable commercial japanese films of recent years ("Waterboys" and "Swing Girls"), lightning has already struck twice. Either Yaguchi was lucky to have struck a nerve or he had a Midas touch for film comedy. The answer, as usual, is somewhere in between. 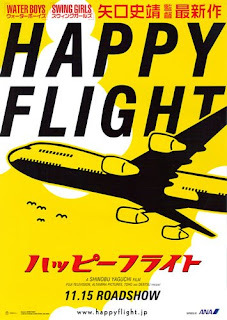 "Happy Flight", Yaguchi's long-awaited follow-up, seemed poised to replicate his earlier successes. Armed with it girl ingenue Haruka Ayase as a rookie flight attendant and a who's who cast of talented roleplayers (jncluding the unflappable Ittoku Kishibe as an air traffic controller manager of sorts), and a script that provides melodrama and personal conflict, it's got all the elements necessary to charm and delight audiences. So the question is, why isn't it better? If I had to guess, I'd say that Shinobu Yaguchi reads his reviews. "Swing Girls" was a hit, but critics complained about the similarities between its plot and that of "Waterboys". Thing is, they're essentially the same: Lovable losers team up, learn a nerdy skill and end up winners of sorts. Some reviewers openly asked if Yaguchi would challenge himself to move beyond this simple construct and try something more ambitious. "Happy Flight" is more ambitious, at least more complicated structurally. Like "Love, Actually" it's a melange of several storylines with unrelated characters, all told within a several-hour period. There's Ayase on her inaugural international flight; Seiichi Tanabe as a pilot challenged by emergency procedures; there's a mechanic with a demanding boss, ticketing agents with impatient passengers, lost luggage, freak storms, crowds, yelling… Yaguchi is skilled enough that he maintains a kind of momentum while hopping from storyline to storyline, but it's all just too much. We don't stick with any one story long enough for its protagonists to have any impact, and all of them seem too easily resolved by the end. It's the worst of both worlds: there's too much going on, but none of it is interesting enough that you want more. Maybe if Yaguchi had focused on two, maybe three of these narratives the film would seem weightier or more engaging. But as it is, it's a mildly pleasant diversion without any of the elation of his earlier "nerds make good" films. Will the nervous young flight attendant get through a series of tribulations? Will the nervous pilot redeem himself in a time of distress? Will the various other subplots resolve themselves in a heartwarming way? In a Yaguchi film the answers are all yes. The question is whether or not you're engrossed enough to care. In "Happy Flight"'s case, probably not. The performances are solid. The parts are well cast and the actors hit all the right notes, but there's an overly familiar feeling to the proceedings. Nothing unexpected happens. There's a certain satisfaction to a well-crafted commercial film unfolding as it should, but "Happy Flight" feels more like a sitcom than a feature. 30 minutes in to the movie I knew exactly how each of the storylines would resolve, and so they did with few minor deviations and, most shockingly for a Yaguchi film, very few laughs. The movie seems to strive to be inoffensive, and it succeeds only at that. Following a formula doesn't have to be this routine.